FFWPU Germany, By Ulrich Ganz, Camberg Neumühle, Germany, 28. – 29. March 2015: In the last weekend of March an extraordinary Divine Principle Weekend Workshop took place at the Seminarhouse Neumuehle, near Bad Camberg. Manuel Domingos, the consul general of the Republic of Angola in Frankfurt, invited an entire family to the workshop. Together with his own family they made up two thirds of the total of 21 participants. Others arrived from Hamburg and Giessen, among them a very sharp and interested Chinese girl-student, a friend of our 2nd gen Benedikta Becker. The age of the participants varied greatly from 10 years all the way up to the beginning of the 60ies. Friday evening was the time to introduce each other. Fritz Piepenburg gave an overview of the Principle in the opening presentation. On the following day, Ulrich Ganz lectured about the creation and the heart of God. Claus Dubisz explained the meaning of the family as the school of love and standard for social norms. Benedikta Becker explained the reasons for the division between God and man. Some presentations were augmented by animations and video clips taken from the internet. All participants engaged lively with questions and discussions. Saturday afternoon is always reserved for a joint walk in nature. It was great fun to cross a swampy part near the brook by helping each other crossing the wet mud. During coffee breaks and meals people had ample time to share with each other. On Saturday evening (the family night) the Angolan community even replayed the fall of man in a rather funny and enjoyable way. There was lots of singing and a guessing game organized by Hilke Ganz who served as the MC. Thus everybody could experience an atmosphere of a “one world family”, even if small in number. The next day was Palm Sunday and Fritz Piepenburg started with explaining the life and mission of Jesus Christ. Claus Dubisz continued with parallels in history and the meaning of the Last Days. Finally the guests could learn about the founder Rev. Moon and his life engagement in giving the marriage blessing to people of all races and religious traditions. These peace blessings are a testimony to a peaceful and harmonious world become reality in our times. 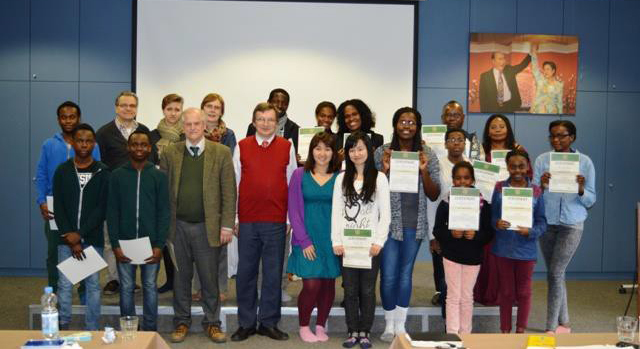 Finally all participants received their certificates and pictures were taken. Thus yet another weekend workshop took place in our newly restored Seminarhouse Neumuehle. The newly arranged cobble stone pavement in the inner yard along with the fresh water and beautiful nature make the place a healthy and refreshing experience. Setsuko Wollmer and her son greatly contributed to the success by preparing delicious meals all throughout the three days.